The bodies are about to start piling up again as everybody’s favorite cannibal gears up for the release of Mannibalector in 2012. 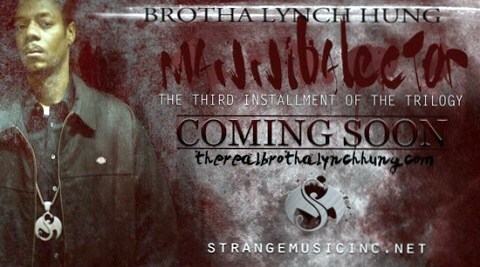 After a revealing interview regarding his direction f0r Mannibalector, Brotha Lynch Hung once again gave fans something to talk about when he hit Twitter to update on the progress of the album. Excited to release the long awaited third chapter of his Coathanga Strangla trilogy, Lynch confirmed that he had produced a track for the album. He followed that up by tweeting the above image that promotes the album’s release. Between his desire to take the album into a darker place and his goal to collaborate with Eminem, it looks like Lynch is prepping Mannibalector to be the epic ending fans expect of his murderous trilogy. Stay tuned for more on Mannibalector! What do you think about the direction on Mannibalector? Would you like to see Eminem appear on it? Leave your thoughts below in the comments section!